When you think about Car Audio, one of the first names that come to mind is the ever so popular Kicker brand of audio equipment. While they have traditionally produced some of the best bang for your buck car subwoofers, they have until recently steered away from home audio. Although it had been out for a few months, we got our first hands on look at the Kicker iK501, at CES 2011. Today we have gotten one in our hands to take a closer look at. Will their home audio be as crisp, clear, and loud as their car audio counterparts? Join us as we take a look. 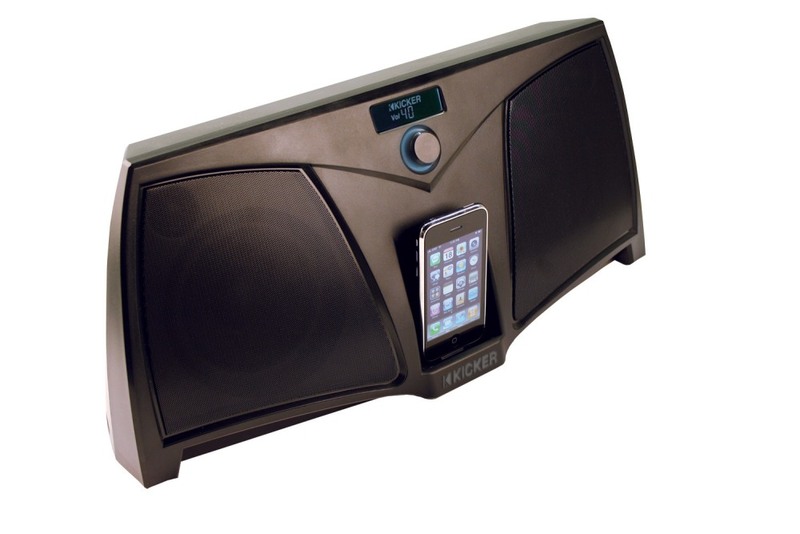 The new iK501 now certifiably works with iPhone,™ along with iPhone 3G and all 4th-generation or newer iPod media players. Another feature is composite video output, allowing the user to play video from the unit to larger screens. Still portable and still loud, the iK501 still features the outrageous, square-shaped reflex subwoofer on the back of the unit, along with a pair of five-inch woofers and silk-dome tweeters. It’s all juiced by a powerful internal amplifier with digital signal processing for the richest, best-sounding docking system available. Dig deeper into DSP with the thin infrared remote, fully featured to fine-tune the iPod or iPhone’s music and video content. It helps to navigate with ease through the iK501 system menu, adjusting bass, treble, and aux-in options, as well as through the iPod or iPhone’s menus and sub-menus. Skip forward and back, fast-forward and back, play and pause, volume, mute, and power on/off selections have their own buttons too. The rotary knob manually serves as the power and selection push button, and controller for bass, treble, auxiliary-input options, or standby mode. Standby will continue to charge the iPod or iPhone even when the system is powered down. In the dark, the knob is back-lit in blue and the display LCD screen continues to steer the user easily through the menu. A minijack input allows a hookup for stereo sound from alternate media, including other MP3 or compact-disc players, desktop and laptop computers, or satellite radio. RCA stereo outputs allow for even more alternative audio hookup. A two-foot auxiliary cable, integrated carrying handle, AC power cord and 22-volt power supply add up to complete a convenient and enjoyable entertainment experience. I just wanted to say this review is biased. I own one and while i definaately would say its awesome, it doesnt have as crisp a bass as you would expect. The bass at high volumes frequently needs to be adusted in techno and hip-hop, though the high range is quite clear.